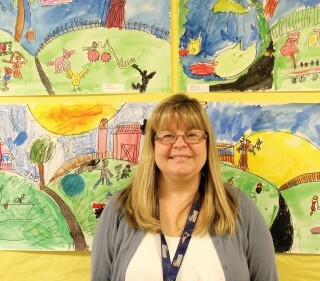 Robin Greeley is an art educator for the RSU14 district. She teaches grades kindergarten through fourth grade with three and one-half days at Raymond Elementary School and grades kindergarten through third grade with one and one-half days at Windham Primary School. Art is her passion; something she defines as sitting down to do and suddenly four hours have gone by and it feels like five minutes. For many years, she worked in the home, raising her children. But once they were in school and was busy with their many activities, Greeley asked herself what she wanted to do next with her life. She knew she enjoyed working with children and had always had an interest in the arts so she started researching and thought she might like to be a teacher. She knew that if she was going to be an educator, she wanted to teach something she was passionate about. It was at that point she made her decision to teach art to young children. “The fact that I get so much joy out of doing art, making art...this is what I’m supposed to be doing because I’m thoroughly engaged, I’m not trying to rush through something...just to complete it. It’s something I fully enjoy, and it fulfills me,” Greeley explained. A Raymond resident and Windham High graduate, Greeley is married with two children. She’s lived between Massachusetts and Florida for many years until she moved to Maine when she was a junior in high school. She graduated from the University of Southern Maine with a B.A. in fine arts and a concentration in education. This past summer she got her master’s degree in special education with a gifted and talented endorsement.